The city of Tangier sits on the Atlantic coast of Morocco at the western opening to the Mediterranean Sea. It covers 144 square miles between the sea and the Riff Mountains. It ranks second to Casablanca among Morocco's seaports and has an estimated population of 554,000 people. The Jewish community is small with approximately 150 members. The climate of Tangier is moderate and subtropical, with an average temperature of 20 degrees Celsius. Phoenician sailors are said to have visited Tangier as early as the 11th century BCE, but the first written record describes a Carthaginian settlement in 500 BCE. The Berbers, a non-Arabic, indigenous people, assumed control after the defeat of Carthage by the Romans. Later, the mighty Roman empire claimed Tangier (2nd century CE) as its own and held it for two hundred years. Hordes of barbaric tribes swept across Northern Africa in the 5th century, only to be defeated by the ever expanding Arab civilization in the 8th century. Tangier became a focal point in the struggle between two prominent dynasties, the Idrissids and the Ummayads. In the 11th and 12th centuries, two successive Muslim sects, the Almoravides and the Almohades wrested control of Tangier. From here they launched their assault on Spain. For the next three centuries, Tangier was a passed back and forth between Portugal, Spain and Britain. The architectural and cultural history of the city reflects the influence of the African, Arabic and European civilizations that took turns colonizing it. Archeological discoveries of ceramic pieces decorated with menorahs date back to the Carthaginian era. 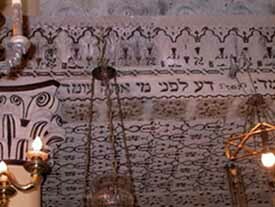 This places Jews in Tangier, then called Tingis, immediately after the destruction of the First Temple. The next significant historical event didn't occur until the Jewish community received refugees from Spain who were fleeing the Visigoth persecutions during the 5th and 6th centuries CE. The Spanish immigrants brought culture, industry and commerce to their new land. Several Berber tribes were even converted to Judaism and the Jews lived in peace for the next several centuries. Abraham Ibn Daud describes in The Book of Tradition how the Tangier Jewish community was wiped out by the Almohades in 1148. Refugees from the Spanish expulsion revived the city for a brief period of time, but ultimately the community came under attack by the Inquisition, which outlawed their presence. The next wave of Jews to settle in Tangier arrived in 1661, when the Portuguese ceded control to the British. The revival didn't last long, however, since the English abandoned the town in 1684 and it began to suffer economically. Ultimately, all the Jews left. The cycle of death and rebirth began again in 1725. At that time only one Jewish merchant remained in the city, and he began to organize a new community. His efforts were helped by Moses Maman of Meknes, who was the treasurer of the sultan. Maman encouraged important Jewish merchants from Tetuan and Rabat to send representatives to Tangier, where they would be exempt from taxes. The strategy worked, and the Jewish community found new life, albeit, most in poverty. The final phase of the community's history began in 1923 when it was declared an international zone. At the time there were 10,000 Jews living there. A cultural revival began with Zionism at the source. During the second World War, the Jewish community of Tangier made a great effort to settle the mass of Eastern European Jews who sought refuge. With the establishment of the state of Israel, the independence of Morocco, and the annexation by Morocco of Tangier, the tide finally turned toward emigration.